From the “On the Civil Side Blog,” please read this important blog by Professor LaToya Powell. Professor Powell discusses the nuances of ordering intermittent confinement, and discusses what if any changes that will occur after the enactment of the new juvenile code reform that will take effect on December 1, 2015. My name is Alexandra (Allie) Michelle Maccioli. I grew up in Raleigh, North Carolina and attended St. David’s high school and graduated in 2010. After high school, I studied at the University of South Carolina where I double majored in Political Science and Criminal Justice. I graduated in 2014 and began at Campbell Law School, where I am currently a 2L. From a young age I knew I wanted a career with the law; I was especially eager about the criminal sector. I worked in the Solicitor’s Office in Columbia, South Carolina during my college career, where I solidified that passion for criminal law. I am hoping to grow my knowledge and experience in working at the Office of the Juvenile Defender, in order to become the zealous advocate that all clients deserve. 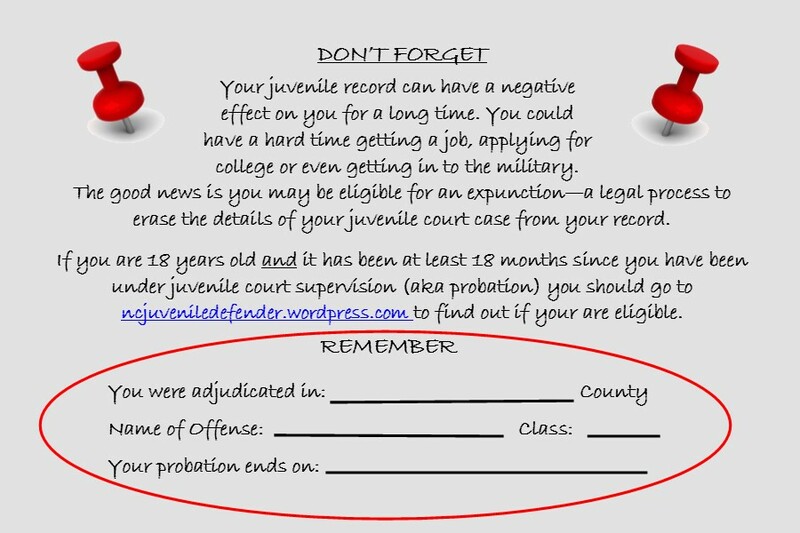 Our next statewide call for juvenile defenders will be Thursday, September 3rd at 1 PM. Call in number is 919-890-2204. Topics will include an ongoing discussion of capacity, court orders which include an order to take medication, and shackling. Looking forward to our discussion! and stay for important updates that directly affect your practice! HB879 – What does this mean for your clients? Update on Raise the Age – Where do we stand today? Click here to register today and add it to your calendar! to attend this complimentary event. The Court of Appeals released five delinquency related opinions in July. Rule(s): Adjudication orders are not required to delineate each element of an offense. Rule(s): A juvenile is not considered in custody unless he is subjected to additional restraints beyond those generally imposed during school hours. Rule(s): (1) Dispositional orders requiring restitution must include findings of fact demonstrating that the best interests of the juvenile are being served. Rule(s): Short form language in juvenile petitions is allowable. Registration is open for the 2015 Juvenile Defender Conference, to be held August 14, 2015 at the UNC School of Government. Registration ends this Thursday, August 6.The Juvenile Defender Conference addresses topics of interest to attorneys who represent children in delinquency proceedings. This year’s conference will address racial disparity and the role of defense counsel. It will include sessions on applying the School of Governments’ Race Manual to delinquency cases and using pre adjudication advocacy to combat racial disparity. The conference will include an ethics session on implicit bias and the role of the juvenile defenders. A case law and legislative update session is included as well. The conference, cosponsored by the School of Government and the Office of Indigent Defense Services, offer six hours of CLE credit—including one hour of ethics/professional responsibility—and feature instructors from across the state. The link to register is www.sog.unc.edu/node/1238.